For the first interview of the year I bring you a daughter of Christchurch, and a little celebration of academic achievement in amongst the tragedy. 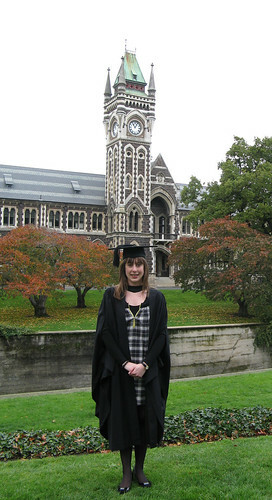 Helen Abbott completed her honours degree at the University of Otago in 2008 in the first class, and was accepted into the postgraduate medicine degree at the Dunedin School of Medicine. Her honours degree and undergraduate studies were focused in Biochemistry and her research project was involved in discovering novel patterning mechanisms in the honeybee oocyte under the supervision of Dr Megan Wilson, and Assoc. Prof. Peter Dearden. Helen, resplendent in her Grad Regalia, 2009. Now in her fourth year of medicine, Helen maintains an active interest in research science by completing summer studentship research projects between the years of med study. Summer studentships are typically 10 weeks of paid research time, in which the young scientist hopes to gain valuable experience working in a (real!) research lab and contributing original discoveries to the field. Helen’s summer research has been in subjects such as the contribution of endothelial damage and oxidative stress to kidney injury in diabetes, and the purification of mycothiol from Mycobacteria and investigating its reaction with bleach. In the limited downtime of a med and part-time-research student, Helen enjoys reading, music, road cycling, catching up with friends and walking her lovely dog. I interviewed Helen to get the perspective of a scientist-turned-doctor (of the medicine variety) on the subject of science communication and her differing experiences between the two disciplines. Why did you leave science for medicine? During my degree I realised I didn’t want a career in research. I enjoy talking to and working with people, and thought I may feel lonely in research. I also like helping people, and felt I could do this more directly through medicine than I could through science. Would you consider coming back to research science in the future? If the right opportunity presented itself. Do you consider medicine a ‘science to be communicated’ better/at all to the public? ie. The communication of disease and disorders to the patient in more detail? Absolutely. If the public had a better understanding of many diseases, I think a lot of our current prevention measures would be more effective. Is the cause (of disease) dumbed down in an attempt to get patient compliance with a course of treatment? Most of the time, yes. You can’t expect patients to understand something that you yourself have taken six or more years to understand. But at the same time, we need to make sure we’re giving patients the correct information, especially with the increasing amount of incorrect/incomplete information available on the internet. Do you think the patients should know as much as they can about their disease/disorder? And should we facilitate this communication? How? Absolutely. The more they understand about it, the more they can be involved in the planning of their treatment, and the more they can ‘own’ their disease/disorder. It’s like the saying, “keep your friends close, and your enemies even closer”. For most people, their disease/disorder is their enemy; it makes their life more difficult, shorter, or more painful. Doctors play a key role in helping patients understand their disease, as they are usually the first person a patient turns to for help. PHOs (Primary Health Organisations) could start running education sessions with nurse specialists and/or a GP on the common diseases that present to their clinics (e.g. diabetes, heart disease). And for diseases that are affected by diet, a nutritionist could be brought in to run similar sessions. However, there will be patients that won’t want to know about their disease/disorder, and we need to respect their wishes. Is science communication (in general) important? Yes. Not only is some of the tax payer’s money being spent on scientific research, but also, most outcomes of research will affect the public directly or indirectly. It is in their best interest to know about it, but it needs to be communicated to them effectively. What impact do you see research science as having on medical practice? Research science will always have a big impact on medical practice. We don’t understand everything about the human body, and many of those things that we don’t understand need to be investigated at the cellular or molecular level. The medical community will continue to rely on the work of researchers. If you could change one thing about how we teach our undergrads, to make it better, what would it be? For the sciences? For the med course? Teaching how to read and critically analyse scientific papers at an earlier stage in the program. Have you found studying medicine to be harder than the sciences? Yes. The sheer volume of information makes it harder. Do you consider it an advantage to have a science background prior to your medical studies? I wouldn’t necessarily say a science background is an advantage. I certainly didn’t feel I had an advantage by studying biochemistry. Maybe some other subjects would be an advantage (e.g. physiology). But I think having a bit more life experience is definitely an advantage. Having said that though, I am continuously impressed by the undergraduates in my year. I think having some graduate students in the med course is a good thing; they offer a different dynamic to the group. Do you have a medical idol? Whom and why? My sister. She has worked so hard to get to where she is, and I know she is a very good, caring doctor. What about for science? Someone you admire & the reasons why? Peter Dearden and Tony Kettle, two supervisors I have worked under. They both work incredibly hard, and yet always make time for students. Their enthusiasm for science is catching. They’re also genuinely interested in you as a person. What makes a good doctor? How does one have to be different from a scientist? A doctor needs to be able to communicate – talk and listen. They need to be compassionate, and they need to have a good moral compass. I would say the same applies to a scientist (including compassion if they are working with live subjects). What are you going to do differently, that will set you apart from other medical doctors? I don’t think there’s one thing that sets you apart from other doctors. And I think it’s very difficult to set yourself apart when there are so many good doctors in New Zealand. I hope that I will always be compassionate and empathetic to patients, no matter how big or small their problem may seem. Hopefully not still at university! Hopefully living in an eco-friendly home in a rural community not too far from an urban centre. What is your broad opinion of Dunedin and the University? Otago Med school? I think the University of Otago is fantastic (and I can say that because I have experienced two other NZ universities). However, it’s a real shame that its reputation is starting to be tarnished by drunk and disorderly students. A few are ruining it for many. Do you think medical doctors should be expected to keep up with the primary research literature on diseases? Would it have any effect? There is an expectation that medical doctors keep up with the clinical literature in their field(s) of expertise, but for them to also keep up to date with all the primary research literature would be near impossible. There are only so many hours in a day. I’m not sure whether it would have any effect if they did. Do you have any training with regards to scientific communication of medicine? Do you think there should be? No I don’t have any specific training. I think it would be valuable for all researchers to undertake some form of training in scientific communication. What would constitute your perfect day in Dunedin? Perfect day in Dunedin: hanging out with friends, but must include an almond croissant from The Friday Bakery, a white hot chocolate from The Good Oil, and a drive out along the peninsula. There is no way I would ever be able to put up with lectures and undergraduate study now that I have been so long out of it and I admire the commitment it takes to put up with a further 6 long years of prescribed undergraduate (even at post grad level) study. I think it a good thing for medical doctors to remember their research science counterparts and the strong links between the two. I also think Helen will be a brilliant doctor, and all the better for her undergraduate studies.